Every detail designed by Motobecane's women's cycling team to meet the special needs of smaller ladies. 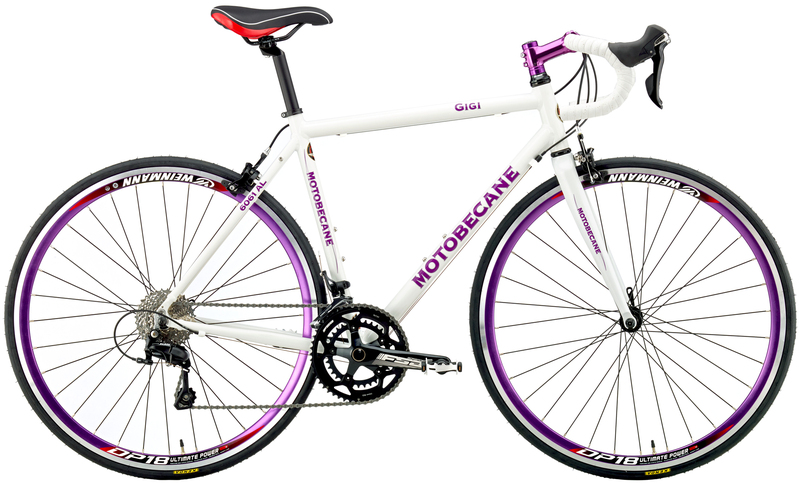 Every Gigi Elite is hand-built from specially shaped WomenSpecific tubing with Motobecane's legendary quality and attention to detail. The only other bikes better may be the higher level Gigi Pro or Gigi Team. Shimano derailleurs and FSA Cranks, True Shimano STI shifters and a comfy and advanced tech Straight Blade Carbon Fiber fork with Aero competition wheels with bars and stems that are proportionately sized for your feminine physique. The ELITE upgrades you to near Pro level Shimano 5800/105 2x11 speed technology. Take advantage of our exclusive pricing of $799 and save hundreds from suggested retail.